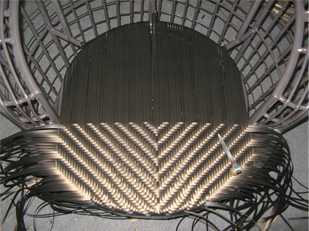 Not all rattan fibre (the weaving material) is created equal. There are two brands recognised as market leaders and these are used only in the very best rattan furniture; Rehau ™ and Hularo™. Both are German. We exclusively use Rehau Stressflex, which is five times more durable than other conventional fibres, allowing us to create the best rattan furniture collections. The Rehau company is the recognised leader in polymer solutions and employs 15,000 staff in 170 countries. You can trust German engineering. 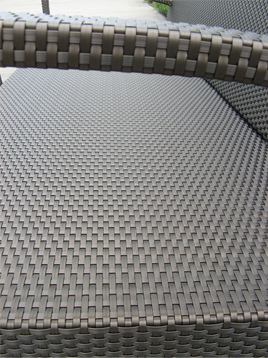 Contrast this material to that used by 90% of other rattan furniture suppliers. They use Chinese fibre which is mostly PVC. A cheap product which has a normal life expectancy of 12 months. Our quality rattan furniture originated in Australasia and we quickly realised that only the best rattan furniture fibre resistant to high U.V. would last. Regardless, German rattan fibre as a raw material costs more than any other fibre on the market, three times the cost of Chinese fibre. This is simply the price you pay for the best rattan furniture fibres on the market. A good frame makes or breaks the integrity of quality rattan furniture. 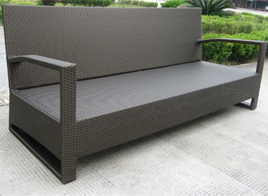 All rattan furniture uses alloy frames due to its relative weight and strength properties. However, as much of the frame is hidden, the customer may wrongly assume all suppliers use the same specification. 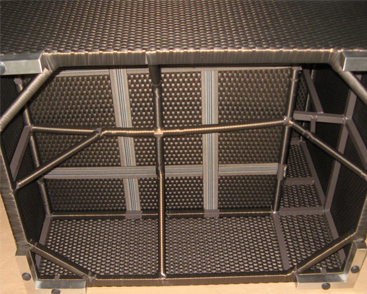 Our industry loves to roll out the quote ‘alloy with powder coating frame’ and customers often think it’s all the same. It most certainly is not. We feel the best rattan furniture gauge of alloy is 1.6-1.8mm round and square bar which is the spec used in high quality branded wicker rattan furniture. A lower quality product will use 1.2mm (because it’s the bare minimum). You will notice our furniture weighs a bit more like for like due to this difference in quality. This is just another way in which we ensure our designs are the very best rattan furniture products on the market. We have gone one step further and love to show off our frames and our manufacturing excellence. What you are looking at is a perfectly engineered, welded and pointed frame, the likes of which you will not see anywhere else in our industry. Look at the bracing. The construction screams quality. This is the best rattan furniture frame construction available. What lurks under the fibre of other garden furniture? (Above) Our logos are solid stainless and laser etched. Attention to detail! This is a Modular corner piece. Please note the extra bracing on all corners for extra rigidity and the use of conventional sofa elastic to make the product more comfortable. 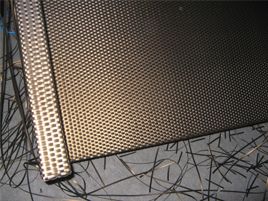 We also fully weave under our frames to make them that much more attractive. 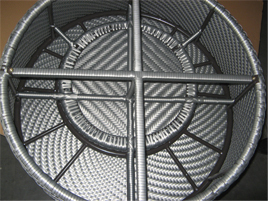 Some of the lateral stringers are not woven because one can only weave in one direction. 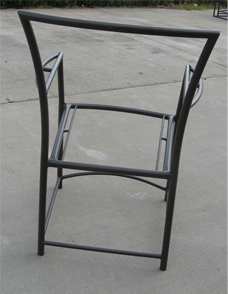 What you are looking at is a dining chair frame which is simply perfect. For a frame which is covered or hidden from view by a woven shell I think you will agree it is perfectly formed with almost no discernable weld lines or paint defects. We employ 1 x 1 weaving techniques in all of our furniture. Every notice how the garden centre variety of rattan outdoor furniture is loose and has gaps? This is a result of using 2 x 1 weaving. A technique designed to weave faster and use less materials. It is a sign of a poor product. One of its properties is the ability to hold 130 kg per strand. Its built-in memory allows it to always return to its natural shape when exposed to any environmental stress such as extreme cold, heat, acids and rain. Iola garden furniture is all weather outdoor furniture in the real sense. Iola is superior to almost all and unsurpassed by none. It is the very best rattan furniture. In fact we know there are only two other brands available in Europe that are producing rattan furniture at our level of quality. Both are at least twice our price point! We only use the best rattan furniture fixtures and fittings. Where exposed metals are incorporated in our designs we only use Stainless Steel, 316 marine grade. This is rare in the market place. In fact we are aware of only one other supplier out of the 100’s who operate in the UK alone who use marine grade. The vast majority of suppliers use aluminium. The reason we don't use alloy is because it corrodes. Please note an iola modular foot weighs in at an impressive 450 grams. Where fixings, gliders and plastic parts are used to protect floors from exposed feet we specify Moss products in Oxford, England. There are no corners cut at iola. Of course all of our glass is tempered safety glass. It is also up to 1cm thick on some dining tables; at iola we perfectly engineer everything. A perfect mirror finish from our Modular feet. You usually only find 316 grade in medical instruments and yachts! 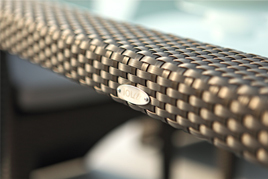 And here’s yet another reason why iola create the absolute best rattan furniture: Iola is one of just two suppliers worldwide using 316 marine grade stainless steel. All weather furniture should use all weather form. We do as standard. All the best rattan furniture products should use all weather foam. We do as standard. If you require any further information regarding our high quality rattan furniture then contact iola today. We cut absolutely no corners, ensuring a premium quality product which cannot be matched anywhere in the UK. And that’s how you create the best rattan furniture! Call 01483 277 266 or email: info@iolafurniture.co.uk or visit our showroom. Reticulated marine foam allows water to pass easily through the cushion foam.